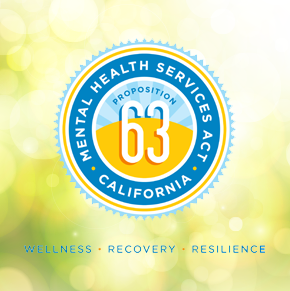 In November of 2004, California voters passed Proposition 63 creating the Mental Health Services Act (MHSA). The Act created an additional one percent tax on any California resident making more than $1 million dollars. The revenue is distributed to counties in order to accomplish an enhanced system of care for mental health services. The passing of Proposition 63 provided the first opportunity in many years to expand county mental health programs for all populations: children, transition-age youth, adults, older adults, families, and especially, the un-served and under-served. It was also designed to provide a wide range of prevention, early intervention, and treatment services, including the necessary infrastructure, technology, and enhancement of the mental health workforce to effectively support the system. Plumas County Behavioral Health (PCBH) is updating community priorities for mental health services as part of its Mental Health Services Act (MHSA) Annual Update and Community Planning Process to help identify needs and gaps in community mental health. Community priorities are an important part of how limited resources are used to address mental health needs in Plumas County. The surveys will be collected from February 4-15, 2019. This survey starts with the community priorities from prior planning activities. It includes an area for you to add mental health services and supports that are important to you and your family. The survey responses will be summarized, and we will hold follow up focus groups and public meetings to review the findings and get your input about how to lower the level of urgency of these priorities. es or call 530-283-6307, ext. 1016. La salud conductual del Condado de plumas (PCBH) está actualizando las prioridades de la comunidad para los servicios de salud mental como parte de la actualización anual de la ley de servicios de salud mental (MHSA) y el proceso de planificación de la comunidad para ayudar a identificar las necesidades y lagunas en la salud mental comunitaria. Las prioridades comunitarias son una parte importante de cómo se utilizan recursos limitados para atender las necesidades de salud mental en el Condado de plumas. Las encuestas se recogerán del 4-15 de febrero de 2019. Esta encuesta comienza con las prioridades de la comunidad de las actividades de planificación previas. Incluye un área para que usted añada servicios de salud mental y apoyos que son importantes para usted y su familia. Las respuestas de la encuesta se resumirán, y se celebrará un seguimiento de los grupos de enfoque y reuniones públicas para revisar los hallazgos y obtener su opinión acerca de cómo reducir el nivel de urgencia de estas prioridades. es o llame 530-283-6307, ext. 1016. Community Services and Supports (CSS) comprises the largest portion of MHSA funding and is for service expansion and system improvements. CSS services are based on a more comprehensive and inclusive approach to mental health programs.The system improvements focus on bringing services to those who are un- or under-served. Services are guided by a “Whatever It Takes” philosophy, in order to assist individuals in meeting their recovery and wellness goals. The intentions of Prevention and Early Intervention programs are to engage individuals prior to the development of serious mental illness or serious emotional disturbances, or in the case of early intervention, to alleviate the need for additional mental health treatment	and/or transition to extended mental health treatment. Innovation (INN) projects are novel, creative and/or ingenious mental health practices/approaches that contribute to learning, and that are developed within communities through a process that is inclusive and representative, especially of un served, under-served and inappropriately served individuals. Funds for INN may be used for increasing access to underserved groups, increasing the quality of services including better outcomes, promoting interagency collaboration, and increasing access to services. These guidelines provide direction while maintaining the spirit of flexibility intended by the MHSA for this component. Capital Facilities and Technology Needs (CF/TN) addresses development of a variety of community mental health facility improvements and technology projects and strategies which support integrated service experiences that are culturally and linguistically appropriate and increase access to services. The purpose of Workforce Education and Training (WET) programs is to create a public mental health workforce which includes clients and family members; is sufficient in size; has the diversity, skills and resources to deliver compassionate, safe, timely and effective mental health services to all individuals in need; and, contribute to increased prevention, wellness, recovery and resiliency. The intent is to provide programs to address identified shortages in occupations, skill sets,and individuals with unique cultural and linguistic competence in public mental health programs.